The finished product of an XFP transceiver, seemingly simple. In fact, the production of a product needs multi-channel detection. There are some parameters are very important in the test. 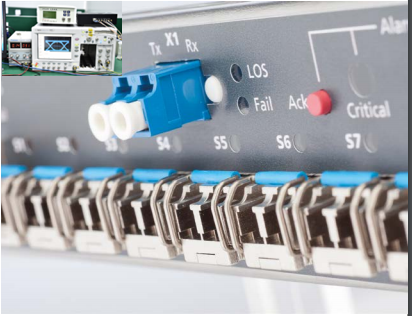 Only these parameters meet the relevant standards can make the optical module best performance. Do you know which test parameters? Now let's learn about it! Output power refers to the light intensity of the transmitting end, unit is dBm, is the important parameter that affects the transmission distance. Receiving sensitivity refers to the light intensity that can be detected, unit is dBm. Generally, the higher rate, the worse receiving sensitivity. That is, the larger the minimum receiving optical power, the higher the requirement of the optical module receiving terminal device. In order to make the laser LD high speed switch work normally. It must be added to the DC bias current IBIAS which is slightly larger than the threshold current ITH, directly expressed by BIAS. Accelerator assembly aging if BIAS is too large, laser can’t work properly if BIAS is too small. The size ratio of optical power when signal logic is 1 and 0, unit is dB. Extinction ratio is inversely proportional to optical power, the extinction ratio will be small when the optical power is large. At a certain transmission rate, the maximum input optical power when maintain a certain bit error rate. It will lead to error generation when the received optical power is greater than the saturated optical power. So error phenomenon will appear if the large output power module without attenuation loopback test. Doing business is not simply selling products, but also show our professional services and product technical knowledge to customers. These knowledge is something that some salespeople lack. If you don’t know the test knowledge, how can customers rest assured that the order to you? To become a best sales, we have to learn from the basic knowledge.